This exceptional vintage Elizabeth II sterling silver mug has a cylindrical barrel shaped form with a plain flared rim. The body of the mug is embellished with a chased naturalistic textured design. 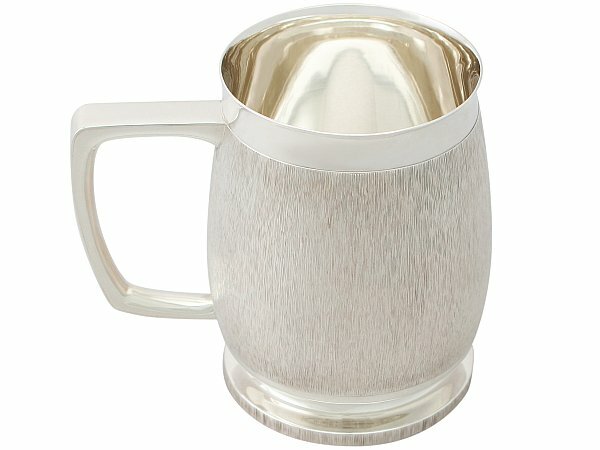 This vintage sterling silver pint mug is fitted with plain angular C shaped handle. The plain spreading circular foot is ornamented with further chased textured decoration to the collet rim. This vintage sterling silver pint mug is an exceptional gauge of silver, exceptional quality and in exceptional condition. Reflections in photographs may detract from the true representation of this vintage silver mug. Length from back of handle to front rim 13.4cm/5.2"